Alexi Musnitsky has been playing piano since he was four years old. His album Zia is his debut released last December. The seven tracks offered on this recording are simple and beautiful compositions, a total exertion of passion and grace. Solo piano can be relaxing and tranquil and Alexi embraces that atmosphere and flow with each track. “Sparkling Heart” is a perfect example of that flow and heartbeat of the music emanating from his fingers to the ivory keys. The everyday complexities of life just roll of your back and fade away listening to these tracks. Each one effortlessly follows the next leading you down the path of tranquility. Music like this is a spiritual experience for me. It is easy for me to forget the worries and stresses of life once this kind of music begins. There is one thing to focus on, the piano and how it speaks to you, pulling you out of any inner and external turmoil you may be experiencing into the bliss; it is as simple as that. Although there are only seven tracks, they embody an artist at work. His heart and soul is pouring into this. Also there is not one track under 4 minutes, in fact the final track “Dream Catcher,” clocks in at 7:08. So there is more than enough to take into consideration within the seven tracks on this album. This definitely can be “The Quest,” as the track introduces those thoughts and feelings. The delights of some nice instrumental music are yours if you so choose. It is a blend of contemporary, classical and new age wrapped nicely into one package. That may sound a bit complicated but it is everything but that. The music of Zia will touch your soul and warm your heart. Let your ears listen and your spirit unfold, the music will lead the way. It most certainly worked that way for me while taking this in. 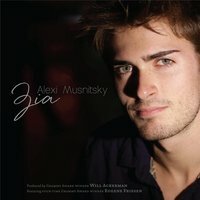 Alexi Musnitsky is an extremely talented solo pianist with a bright future ahead. I look forward to hearing his next release.